Taco says she is somewhat dubious about all of this. Help convince Taco — pick up a copy soon! In Tabat, Beasts — magical creatures like dryads, minotaurs, and centaurs — question a social order forcing them into its lowest level. Adelina Nettlepurse, scholar and secret owner of Spinner Press, watches the politics and intrigue with interest, only to be drawn into its heart by a dangerous text and a wholly unsuitable love affair with a man well below her station. When Adelina’s best friend and former lover, glamorous and charming gladiator Bella Kanto, is convicted of sorcery and exiled, the city of Tabat undergoes increasing turmoil as even the weather changes to reflect the confusion and loss of one of its most beloved heroes. This entry was posted in Cats Sleep on SFF and tagged Cat Rambo by Mike Glyer. Bookmark the permalink. A lovely girl. 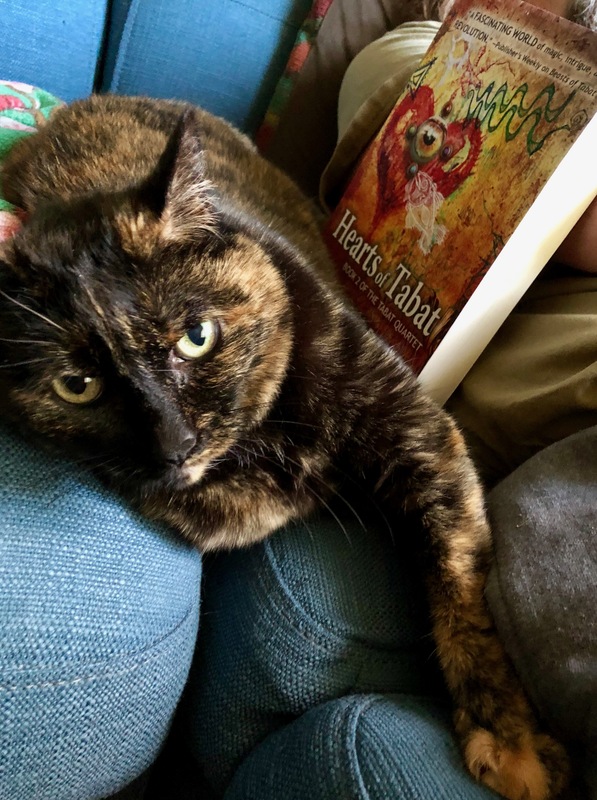 Yes, we must convince her she’s not wasting her naptime, promoting her pet human’s book. Her fur is really unique! She is making insufferably cute noises at the moment. Very pretty cat and a very nice story as well! Promoting a book is too close to work. What’s the point of being a feline if you have to do things? KITTEH! What a beautiful tortie!